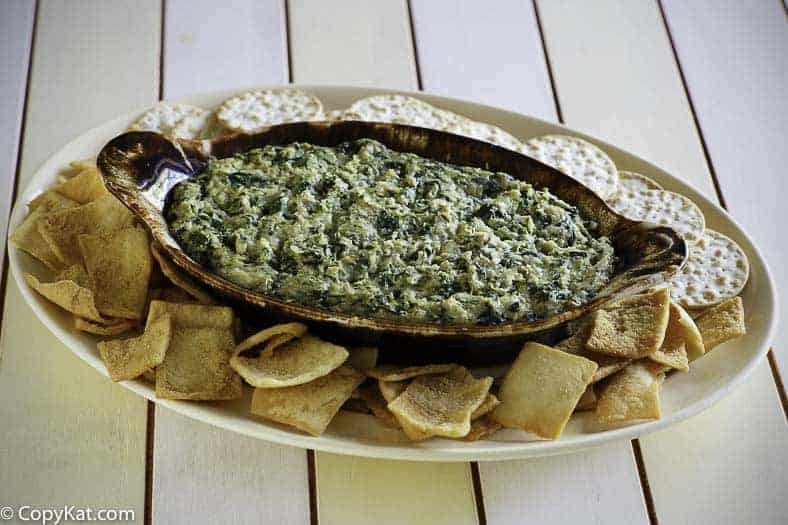 Houston’s Artichoke Spinach Dip is a more complex spinach dip than most that you may have tried. This appetizer has become my go to dish for large parties, and gatherings. This recipe has multiple kinds of cheese and a hint of garlic to make this artichoke spinach dip extra tasty. We hope you enjoy this version. Houston’s Artichoke Spinach Dip has to be one of my favorite artichoke spinach dips, it is full of flavor, and this is one of the most popular recipes at CopyKat.com. I have to confess I think that I love most anything that Houston’s offers. Houston’s is an upscale American dining experience. I have never been disappointed with anything on their menu. While I love to dine there, it can be more expensive than many other restaurants that are out there. This spinach dip is served piping hot at the table, I know you will love this treat. 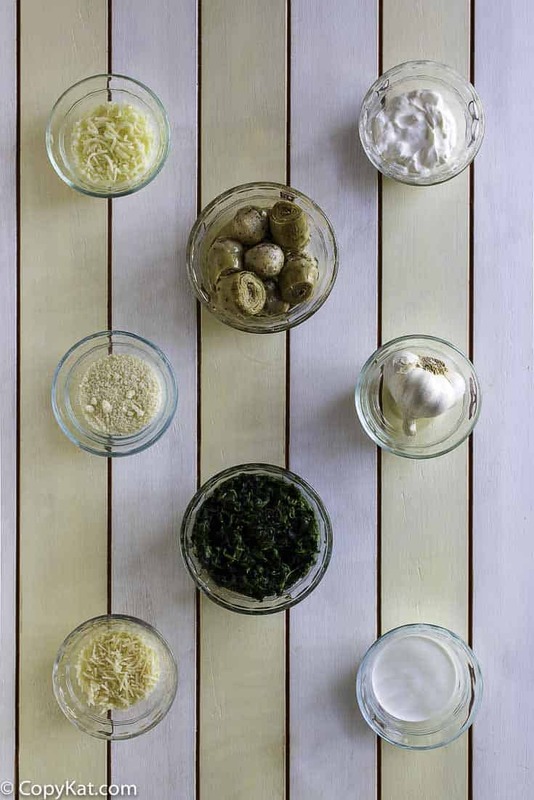 It is made with frozen spinach, artichokes, and several different types of cheese. You are going to love this flavor combination. Be sure to serve this dip with plenty of corn tortilla chips. 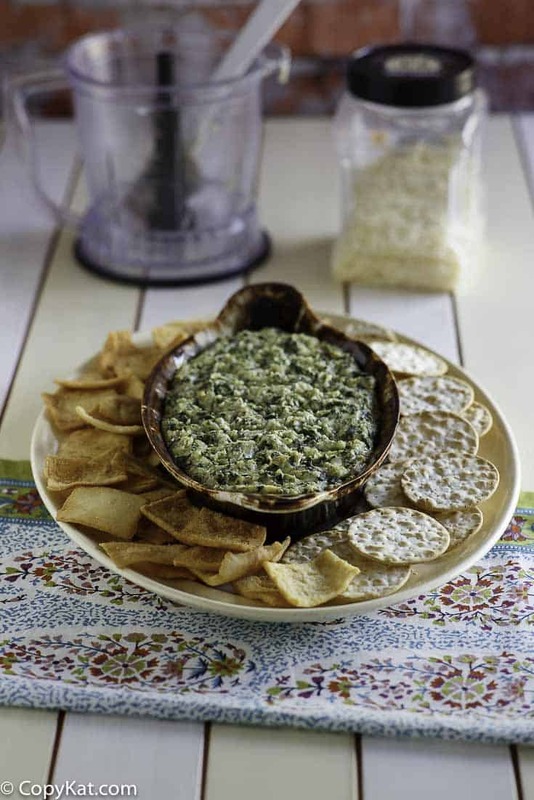 You can recreate Houston's Artichoke Spinach Dip at home. In food processor blend artichokes, Romano cheese, garlic and Parmesan cheese for about 1 - 1 1/2 minutes. Artichokes and cheeses should be minced, but should not be pasty. In a mixing bowl add drained spinach, cream, sour cream, mozzarella, stir well. Spoon into mixing bowl mixture from food processor. Blend all ingredients. Mixture should have a medium thick consistency. Spray an oven proof shallow serving dish. Pour artichoke mixture into baking dish and bake for 20 - 25 minutes at 350 degrees. Artichoke dip should be a little bubbly and cheese melted through. Remove from oven and serve with your favorite heated tortilla chips, sour cream and salsa and enjoy. I’m not trying to be rude, but anyone who says your version of Houston’s Chicago Style Spinach Dip obviously didn’t follow your recipe precisely. I know this to be a fact as I’m friends with one of the line cooks at the Houston’s out here in Manhattan Beach, California. While he won’t tell me if it’s exact, as he signed a confidentiality agreement to never disclose the recipe, he did say it’s the closest one online. I have a feeling most folks who say it’s not it, didn’t invest in the best quality parmesan available – the one Houston’s uses — Parmigiano Reggiano. You have to use the very best ingredients available to get the taste spot on. Thanks, it’s really hard to get a substitute for this brand of cheese. I buy mine at Costco to help save money on it. I remember a waitress telling me there is gruyere cheese in there. No mozzarella! Try this recipe but substitute the gruyere. Then it’s the closest! Great base recipe… Make it your own by adding stuff like marinated sun dried Toms, fresh basil, crab, shredded chicken, whatever you like. Don’t be a copy ???? Wow this looks fabulous hope when i will make it taste the same as Houston’s. This dip recipe is so simple to make and also looks like very healthy. I’m sorry to say in my opinion, this recipe taste nothing like Houston’s! I am really sorry you didn’t like the recipe, I imagine for you it was a complete waste of time. I am sorry. FYI, if this helps this is what I know that are the ingredients but don’t know the ratio. You can probably figure it out. Sauce: oil, butter, onion, garlic, flour, ck stock, whole creme, raggiano, sugar, lemon, sour cream (might be for serving), Tabasco. At end of mix add spinach and artichokes. Garnish with raggiano! We love Houston’s spin dip and now I don’t need to spend a fortune enjoying it! YUM! it definitely uses reggiano, asiago and tabasco (franks) and heavy cream. I made this last night, and it was wonderful, so close to the Houston’s version (which is delicious). I felt it needed just a pinch of salt and maybe a tiny bit more sour cream, which is what I’ll do next time. Thanks for figuring this out! Houston’s was our family’s favorite restaurant in Kansas City when we lived there. I’ll make this one regularly! I am so glad you enjoyed this. Thanks for your hard work on this….I have tried many times and failed, Houston’s spinach dip is by far, the best, and I can’t wait to try your recipe. I was a server there about 10 years ago, and got ‘busted’ by a cook while I was trying to write down the recipe. So sad that they won’t share, but I guess for a business, it makes sense. The only thing I remember from my menu test was ‘asiago cheese’ in case you try again! Good luck, and thanks, again! I normally just let it thaw out on the counter. To thaw the spinach, can i heat it in the microwave or should i just let it sit out to thaw? Thanks for the advice! This recipe looks really good, but it is not 100% accurate. I frequent Houston’s about once every other week and have been told countless times that the Spinach and Artichoke dip is sadly not vegetarian. Exactly. They use chicken stock in their dip. hi, does the artichokes come from a can or do you take them out from the real vegetable? Mine come from either a can or a glass jark, I do not use fresh artichokes for this recipe. thank you! and one last thing.. in this sentence ” Spray an oven proof shallow serving dish” with what do you spray the dish? Can y this recipe be prepared ahead of time and put in fridge and then bake right before serving? Yes you can make this recipe ahead of time and reheat later. i used to work at houston’s and i know for a fact that their chicago-style artichoke spinach dip is made with chicken broth. do u remember the recipe from when you worked there? I never worked at Houston’s. I also worked at Houston’s and it wasn’t called the Chicago style spinach and artichoke dip. Ours did not have any Monterey Jack cheese or chicken broth. It did however use Reggiano Parmesan cheese though… which is more expensive than regular parmesan. I’m going to try this tomorrow for Memorial Day. Thanks Stephanie!